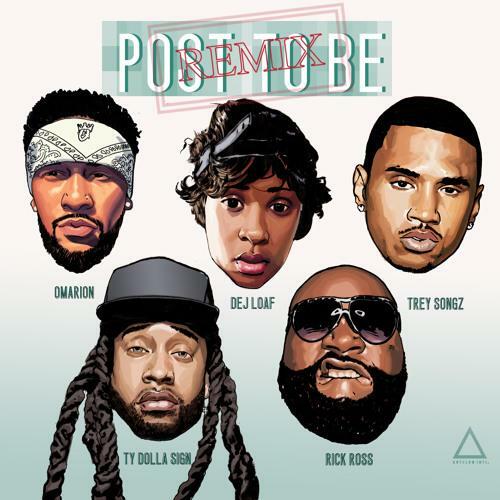 Dej Loaf, Trey Songz, Ty Dolla $ign & Rick Ross assist Omarion on a new remix of "Post To Be." Even if you haven't actually heard Omarion, Jhene Aiko and Chris Brown's November track "Post To Be," you've definitely heard about Aiko's "Eat the booty like groceries" line on the track, as it continues to pick up steam on social media. Fittingly, that's the only line of hers that's included on a new remix of the song, which replaces her and Breezy with Dej Loaf, Trey Songz, Ty Dolla $ign and Maybach O's label boss, Rick Ross. With each guest getting a verse of their own, this remix is just as eclectic as you'd expect. The most unexpected moment? Rozay name-dropping J Dilla and The Pharcyde. Never pegged him for a "Runnin" fan, but that's cool.